This month for the Children's Classics carnival over at 5 Minutes for Books we're highlighting the works of A.A. Milne. We were out of town this past week and so we didn't get a chance to explore Milne's works as I had hoped. However, we were visiting a place where Milne has had some degree of influence and so I thought instead of discussing Milne's books, I'd discuss the man himself. Milne was an interesting man, who gained in popularity with the creation of Winne-the-Pooh and who apparently spent the remainder of his life resenting it. He kinda seems like the actor who has played a specific role in which the public loves them and therefore they are forever doomed to play the same types of roles because the public "demands" that they always be seen in a certain light. So was the life of Milne. He was a successful playwright, magazine contributor and mystery novel writer. All of these things were overshadowed by Pooh. And am I personally sorry for it? Well, not really. The best things win out and if Pooh was his best I would hope he wouldn't have complained too much about it. It's one of those "don't bite the hand that feeds you" sort of things. * Milne's favorite author was P.G. Wodehouse and helped back the stage production of Wodehouse's A Damsel in Distress . * Milne was a pacifist who still served his country in World War I. He was a signaling officer and was sent to the front lines in France until he began suffering from fever. He was then pulled from the front and was put in charge of a signaling company at Fort Southwick until his discharge in 1919. * Milne adapted Kenneth Grahame's The Wind in the Willows (Signet Classics) into a stage play called Toad of Toad Hall. * Christopher Robin was the name of Milne's only child (a son, obviously). The characters in Winnie the Pooh were based on some of his son's stuffed animals. * Milne declared that The House at Pooh Corner would be the last Pooh book because he wanted to shield his son, Christopher Robin, from the success and fame of it all. * Milne suffered a stroke and underwent brain surgery from which he never full recovered. He died in 1956 although someone noted him as seeming ". . .very old and disenchanted" in 1953. * Upon his death, Milne's wife of 43 years, Dorothy "Daphne" de Sélincourt, sold the rights to Winne the Pooh to Walt Disney. The rest, as they are wont to say, is history! * The Winnie the Pooh most of us are familiar with appeared in 1977 and included a new character - gopher (he's "not in the book, you know!"). Since then Pooh has been transformed a bit. Apparently the Milne family was not very happy with Disney adaptations but . . . well! Here it is. And we love it. 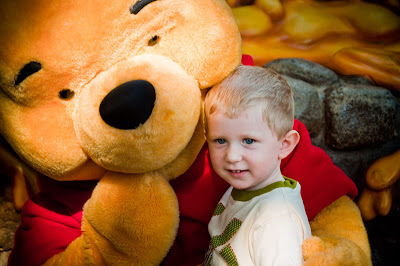 This past week we went to Disneyland in California and my two year old son met his "best friend" Pooh. I will never forget this moment for as long as I live! He walked up to the big character, gazed solemnly up at him and said with great awe and reverence, "Hello, Pooh." We had so much fun at Disneyland but the highlight for us was most definitely Pooh. (We also met Tigger and bounced with him and hugged Eeyore.) We rode the Winnie the Pooh ride no less than 8 times. (It would have been more but mommy & daddy kinda wanted to move on to other things.) Ever since we got back he's been saying (in a wobbly foreboding voice), "Hefflumps wooooooooozlless......steal honey.....beeeeewwaaaaaarree.....beeeeeewwaaaaaaare!!!!" It's incredibly cute. We love Winnie the Pooh, even if Milne eventually did not. We're thankful for him, even if Milne wasn't. We're glad he's still around and look forward to getting to know him better as the years go by. Very funny (we love Pooh even if Milne does not). I like seeing a pic of Milne and have to say he looks a bit like Pooh!! Your little man is so cute! :) What great facts about Milne (that I didn't know). Pooh is also a favorite in our house, and I may also say he is a staple, a main part of our lives, we love Pooh! Thank goodness Walt Disney took over Pooh's career! Great post, Carrie! I find it interesting, too, that Milne did not read his own stories to CR. It goes along with the poem I posted in my Milne post. LOVE the Disney observations!! Great shot of you ds--so precious! Now that I think about it, I had a Pooh crib. Interesting tidbits! I love learning about "the story behind the story", if you will! Very sweet picture of your son and Pooh! "Milne never read his poems and stories about Pooh to his son. Instead he preferred to read his son stories by Wodehouse. (I find this fascinating!)" That is really interesting. Once while listening to a Wodehouse story on CD my kids were totally enthralled. I was totally amazed--I figured it was too old, but see what I know. Interesting! My boys loved Pooh when they were little; one of them called him "Winnie YAH pooh"--which I thought was so cute!